Following a June mandate to vacate its Downtown Brooklyn digs as the burgeoning mixed-use City Point project begins a new phase of development, urban foodie & retail oasis Dekalb Market was intending to scout out a new space for the holiday season. But it looks like we can fuhgeddaboudit. The Brooklyn Paper reports that the space—which opened last year at Flatbush and Willoughby Avenues—will not reopen this year after it shutters on September 30. 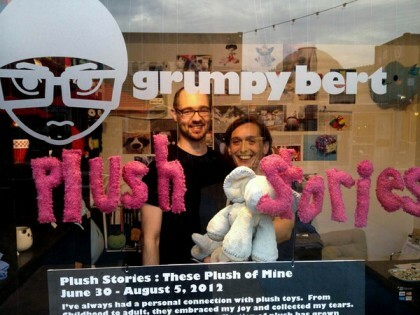 That, however, has a number of the small business owners that populated Dekalb Market up in arms. 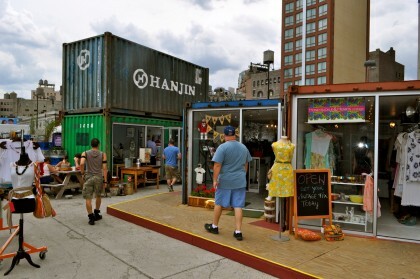 They say they’re now stuck without a place to peddle their wares this fall and winter because Urban Space broke their leases to make room for development on the Downtown lot, then failed to find a new site for the market. The company previously promised to “move and reopen in the space of a few weeks” when it announced it would vacate the current market to make way for City Point development, which will include a Century 21 and potentially Brooklyn’s tallest building, Brooklyn Paper says. Vendors are griping about plenty more. Read the full story in Brooklyn Paper here. Sholay Productions, sponsors of the monthly Manhattan Desilicious bash, are bringing the extravaganza to Brooklyn to celebrate India and Pakistan Day. “Desilicious Freedom Fling: An Outdoor Summer Dance Party” will be held Saturday, August 18, from 6 p.m. to midnight, at Dekalb Market, on an open-air dance floor, featuring a blend of Bollywood, Bhanga and House Music by Ashu Rai. Opening act Atif will offer Indian and Pakistani dance beats, while large screen Bollywood visuals will also be projected. Dekalb Market is in Downtown Brooklyn at 138 Willoughby Street and Flatbush Avenue. Admission to the Desilicious Freedom Fling is $10 before 8 p.m., and $15 after. 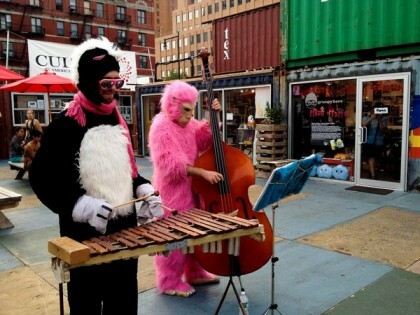 The local chefs at Dekalb Market will also be on hand to serve up dinner between dancing. 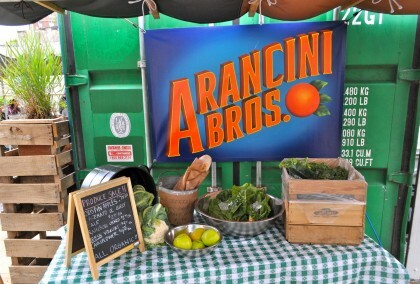 “Explore the market to meet Brooklyn artist-entrepreneurs and sample the diverse dining offerings. Look out for some tasty West Indian dishes by Brooklyn’s Kallabash cuisine,” Sholay Productions says. “Don’t miss an exuberant evening of mingling, nibbling, shopping, dancing and liberated Desilicious revelry.” (Drag queens are a regular fixture at the Manhattan parties.) The space is partially covered, so the festivities will take place rain or shine. See more at Facebook here; and a New York Times profile of Desilicious here. 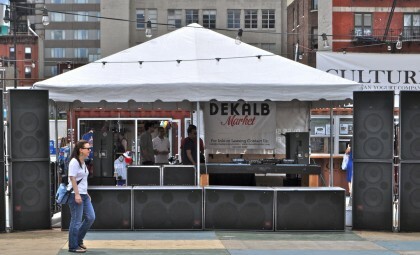 To celebrate its one-year anniversary, Dekalb Market is planning a shipload of special events for Saturday, July 21, including live local music, face painting, a bouncy castle, raffle giveaways for $50 Dekalb Market gift certificates, free food samples, retail specials… and tons of fun. 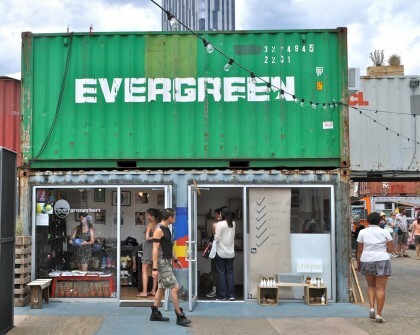 Situated over an entire square block at 138 Willoughby Street and Flatbush Avenue in Downtown Brooklyn, the destination comprises 60 food and retailer shops framed in recycled shipping containers. 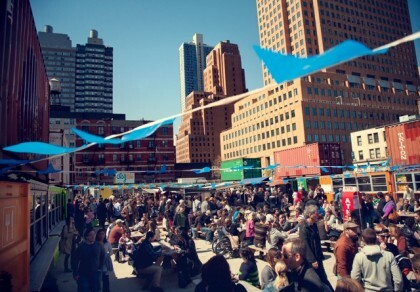 Dekalb Market will also feature a slew of new weekly events throughout the summer, including Ladies Night, Baby Meetup and Happy Hour at “The Get Down,” Dekalb Market’s beer and wine garden, with local craft beer, wine and sangria. 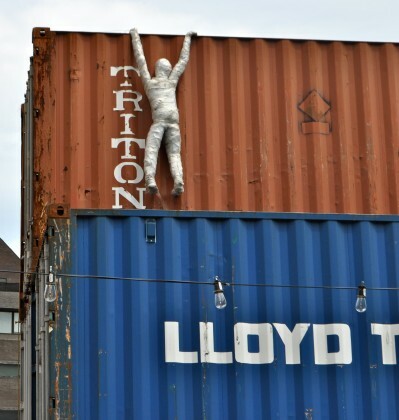 Additional summer events include family-oriented curated music, art, food and film experiences such as “Down & Derby” roller-skating, live music, dancing and yoga. Dekalb Market was recently honored with the 2012 Brooklyn Chamber of Commerce Building Brooklyn Award (BBA) for Retail. Among its kudos: “Brooklyn-ness.” See more details here. Smiles, everyone! 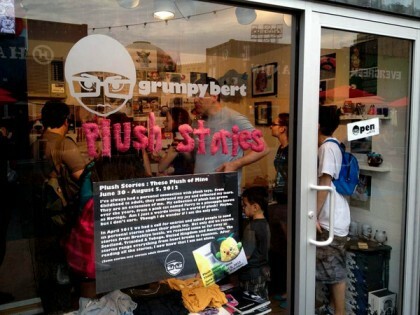 Over the weekend, BHB pal/BH resident Grumpy Bert in Brooklyn launched the new art exhibition “Plush Stories: These Plush of Mine.” The showcase of personal stories & photos of plush toys includes 50+ exhibits from the likes of Scotland, Trinidad & Tobogo, the U.K. and Australia. Stories run the gamut, from heartbreaks to reunions. 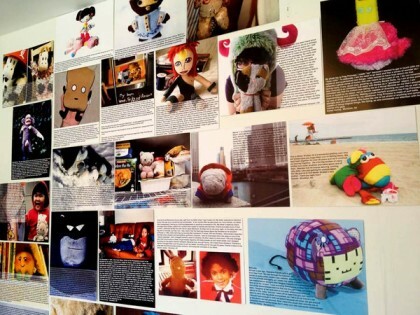 Bert says, “Some plush are simply cute, others just strange.” The exhibit runs through August 5. 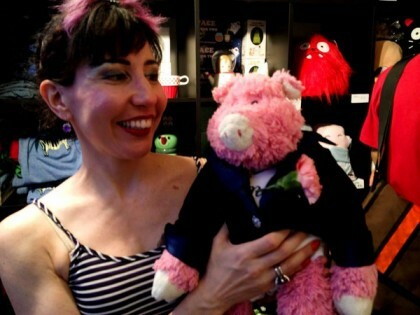 Bert’s shop and mini gallery is located at the DeKalb Market in Downtown Brooklyn at 138 Willoughby Street, and offers a collection of “cutesy, artsy gifts, designer toys, art prints, books, magazines and apparel.” Owner/operator Bert says, “We’re just a little mom & pop business surrounding ourselves with things we love.” Pics from the June 30 Opening Night reception below the jump. Fans of the wholly original Dekalb Market are going to have to find a new weekend play date for their urban retail and foodie fix. The landlord of the Downtown Brooklyn space—which opened last year at Flatbush and Willoughby Avenues—has informed its operators that they must vacate the premises by October. In its place will be the next stage of the burgeoning mixed-use City Point project. 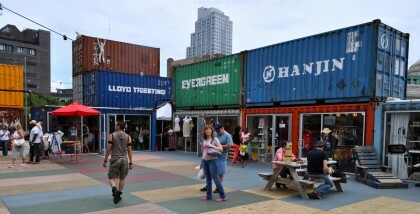 The founders of the Dekalb Market—which houses an emporium of 60 boutique shops and eateries constructed from salvaged shipping containers—says they are disappointed by the developer’s plan to begin construction this soon, after being led to believe they would have five years to utilize the former empty lot. According to Eater, there is no word yet on where the market might relocate, although one potential spot is a private parking lot across Gold Street. As many of you have heard, our landlord has given us notice that they will begin construction this fall and therefore, we will be moving Delalb Market to a new location. While we have not received official notice, we understand the Landlord’s construction may begin as early as October. While we are disappointed that the Landlord’s new development plans moved as quickly as they did, we see this as a great opportunity for Dekalb Market. By positioning ourselves as the first shopping center in history to move and reopen in the space of a few weeks we will be able to have a new “re-opening” with both the press and operations. The move gives us an opportunity to learn from the first year and make improvements and towards this end we will be conducting a survey to make sure we capture everyone’s input. We have identified a couple of sites that would be ideal for the market in the Brooklyn area and are diligently working to make the transition work. We hope you will be able to continue with the Market in its new incarnation. We will provide an updated report to the new site and details regarding the move shortly. Last weekend, your BHB scribe at last took in the curiosity that is the Dekalb Market in Downtown Brooklyn. 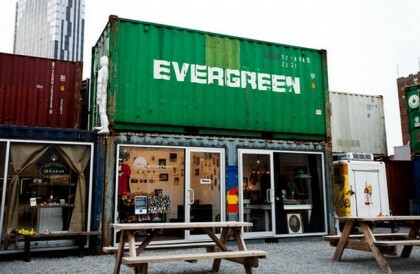 Situated over an entire square block, the emporium of boutique shops and foodies is constructed from salvaged shipping containers converted into 60+ venues that frame a space for outdoor events and programs. 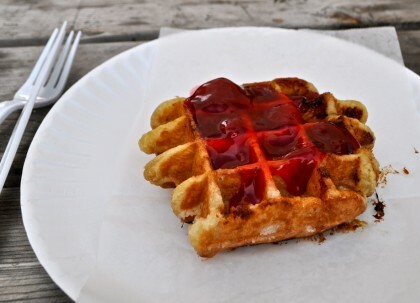 Not to be missed: Waffle n’ Go, offering authentic liege waffles and a variety of delish toppings; Gourmet Sorbet, with all fresh ingredients; Open Oyster, featuring raw & steamed Fisher’s Island Oysters; and Mighty Balls, a tiny tucked-away food shop with delicacies lightly fried. 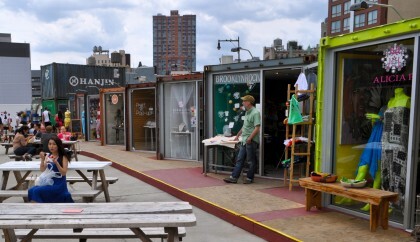 The regular Dekalb Market Hours are seven days a week, 8 a.m.-10 p.m. This weekend, June 9-10, the special feature is underground busk artists playing from 12-6 p.m., with a “Busk-Off” at 5 p.m. Saturday. The space was voted Best New York Architecture in 2011 by the New York Observer.